I have my favourites in the kitchen garden, the crops I can’t imagine being without. I can’t imagine tiring of first early Lady Christl potatoes, or the candy-striped Chioggia beetroot, sugar snap peas, cavolo nero or Berrettina Piacentina squash or Sungold and Black Russian tomatoes. But in other areas I am a lot more fickle. Quite deliberately I look for new veg and new varieties to try each year. 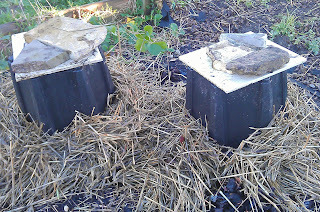 It’s part of why I took on the allotment and the luxury of space for experimentation. Last year, I successfully grew ginger (indoors), physalis and sweet onions for the first time and was correspondingly unsuccessful with celeriac; the year before I had a complete 'mare with salsify. This year’s newbies show a bias towards the new world. It’s partly intentional as I’m developing a Secret Garden Club workshop based on the food from the Americas, so some of the new produce is being grown for harvesting and tasting for the meet-up on September 1st (more info and ticket details here). These very attractive fruits look like stripey grapes and taste, apparently, of cucumber dipped in lime juice. We’re going to grow these in the Secret Garden this year – according to the supplier Suttons Seeds, the plants will climb vigorously, so we’re going to train these up a wigwam made of willow canes and hopefully we’ll be harvesting the fruit from July. Or Solanum muricantum to avoid potential confusion. 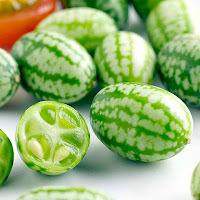 I first encountered these fruits which both look and taste like a cross between a melon and a cucumber about 20 years ago in Chile, where they are called pepinos dulces. I’ve often wished I’d brought some seeds home as the climate in southern Chile isn’t so very different from the climate in northern London, and have been keeping a look out for them ever since. This year I found them in Thompson and Morgan’s catalogue. This is another one to grow indoors, cautiously, to start with and to see if the conditions warrant taking them outside into a sunny sheltered spot – my patio, in this instance. 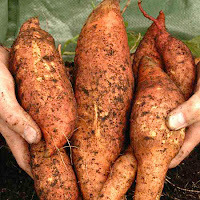 Although really a sub-tropical plant, cultivars of sweet potatoes (Ipomoea batatas , so related to the morning glory) are being bred to better withstand our cool wet summers. This year I’ve ordered some plug plants of the variety Beauregard to grow in a sheltered spot in the Secret Garden – the supplier, Suttons, claims that this is a better option than the more conventional sweet potato ‘slips’, or cuttings. 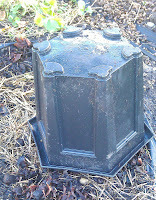 They’ll need as much warmth as possible, so I’ll cover the ground the black plastic and plant them out through holes cut into it in late spring and cover with a Victorian-style bell cloche. Then we’ll see how the summer goes from there. If it’s anything like last year they’ll stay under cover. And even if they don’t provide much in the way of edible tubers, the young leaves and shoots are apparently also edible and can be cooked like spinach. 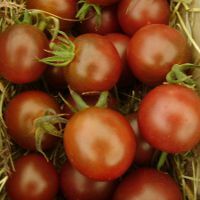 There are so many tomatoes to choose from that it’s worth trying some new varieties every so often. I’m in a bit of a rut with tomatoes at the moment: Red Alert for early ripening, Brandywine and Marmande for cooking and making passata, Black Russian for flavour; Sungold for eating straight from the plant … Black Cherry looks as it would make a fabulously striking addition to a mixed salad bowl, like a Goth version of Gardener’s Delight. 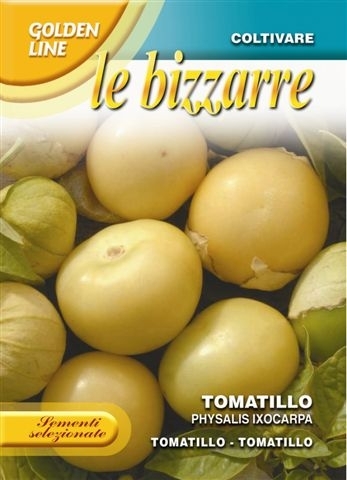 Available from Heirloom Tomatoes and others. I can grow great pak choi under cover right at the start of the season, sowing in February or March to harvest in April and May, when, let’s face it, you’re not harvesting much else. After that, I find the slugs and the flea beetles get them, however much I try to prevent it, and also by May/June, lots of other summer vegetables are demanding attention. 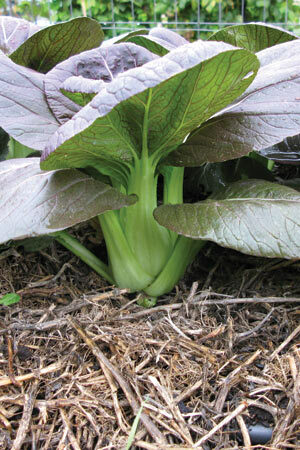 So pak choi is an early spring crop for me, and the more of it I can raise in that short space of time, the better. With this red version from Nicky's Nursery, I’m looking for a deeper, mustier flavour than the bright spring green of the conventional variety. 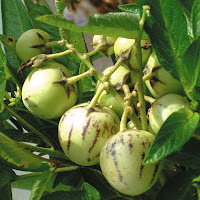 After our fantastic results with tomatillos in the Secret Garden last year, I’m going to try these on my rather more exposed allotment, where I’m also going to grow a couple of Szechuan pepper plants this year – more on this they're ready to go out into the ground. We’re also hoping to plant some witloof chicory for forcing in the Secret Garden later this year and I’ll blog more about that on the Secret Garden Club website once we’ve got going with that. Forced rhubarb is that which has been made to grow earlier than usual by being kept in the dark. This is what they do to the rhubarb grown in huge sheds in the famous Wakefield triangle, and sold - at a premium - in shops from December onwards, but it's very easy to force your rhubarb plants on a domestic scale as well. 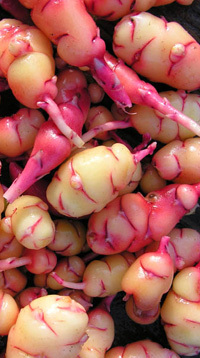 The resulting stems are rosy pink, long and slim. They taste slightly sweeter than conventionally grown stalks, perhaps all the more so for being available when most homegrown produce is either dormant or left over from the autumn. You can buy special pots for forcing rhubarb but apart from a certain aesthetic appeal I’m not sure what the point of them is. 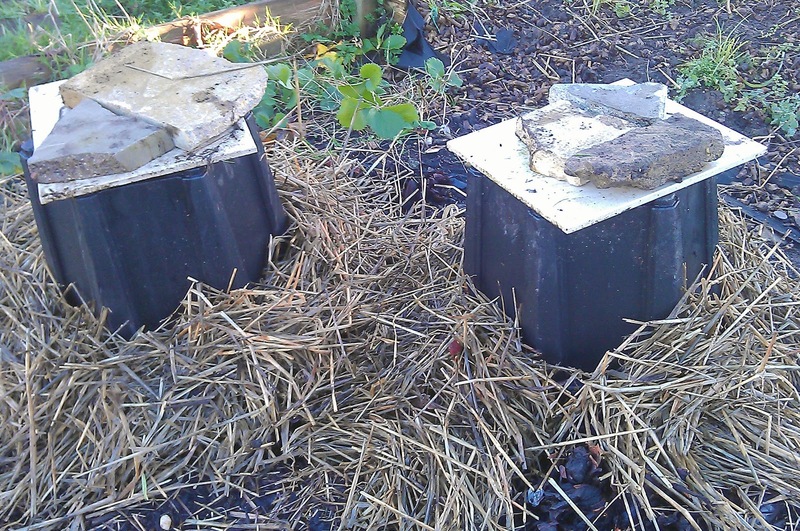 All you need is a bucket, a weight – half a concrete slab will do – and some straw or similar packing material. to ensure all light is excluded. Once your rhubarb shows the first signs of coming to life again in January, up-end the bucket over the budding root. Put the weight on top to ensure the bucket doesn’t get blown over. Pack the straw around the base of the bucket inside and out to ensure that all light is excluded from the interior of the bucket. The budding rhubarb needs total darkness. Wait six weeks or so – anywhere between four weeks and eight in my experience. Start checking after four, anyway. You should be able to harvest your slim, pale pink, forced rhubarb in February and March. Make a note of which of your rhubarb crowns you forced this year and do not force these particular plants again next year. Give them a chance to grow on naturally before forcing again. Forced rhubarb is more tender than conventionally grown stalks so treat it gently for cooking. I love rhubarb crumble but always feel this is a quite a hefty treatment for these more delicate stems. I usually simmer them, either on top of the cooker in a pan, or in the oven, in a very light syrup, or with orange juice. I also like the idea of serving rhubarb with meat or fish as part of the man course - Jamie Oliver teams rhubarb with pork in a number of recipes and Hugh Fearnley-Whittingstall has an interesting-looking recipe for forced rhubarb with mackerel in The Guardian this week. Having cleared and dug out an unruly bramble hedge over the last year, I've clawed back some space on my plot - about 6.5m x 3m in total. What I thought was a thin hedge was sprawling year on year over the rest of the plot. 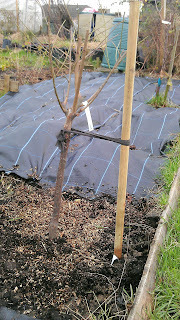 In its place, I planned to plant some new fruit trees rather than create new veg beds. I already have damsons, plums, pears and a quince tree, and I find myself thinking more about fruit when there's a space to fill. 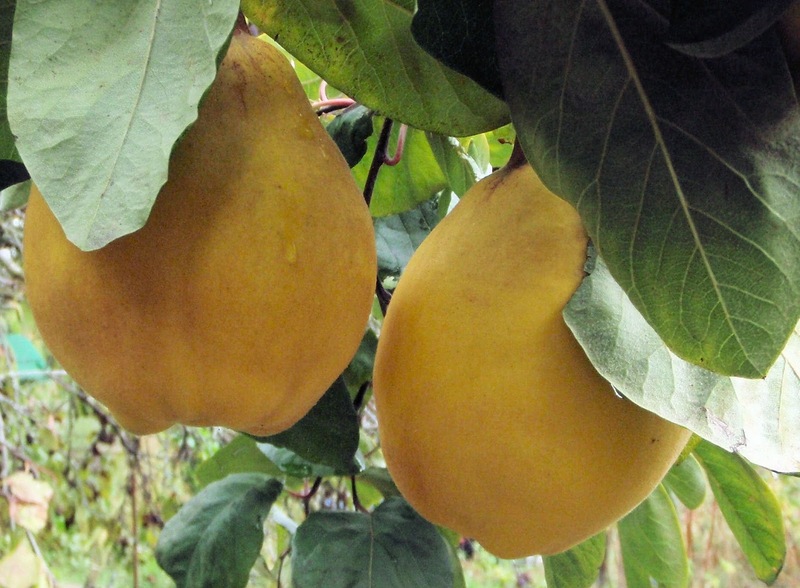 Fruit trees tend to be much less labour-intensive than vegetables: they don't need replanting every year, just a spot of pruning, weeding under the canopy and checking for pests every now and again. Another reason for going with fruit, I realised as I was cutting down the bramble hedge, is that it had been useful, not just in giving us a glut of blackberries every year, but in acting as a windbreak, as it lined the western edge of the plot, blocking and dissipating the prevailing winds. I'm hoping the fruit trees will do much the same job as they mature. 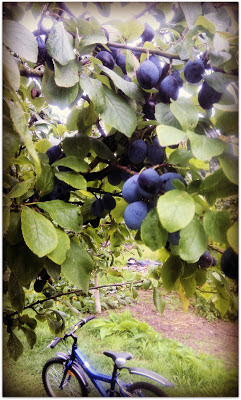 I consulted my ten year old as to exactly which fruit trees to plant; after all, he will be eating most of the produce. After some lively discussion and an agreement that it's disappointing that you cannot grow mangoes outdoors in London and really not worth trying, we chose two cherry trees and two greengages. and a soft tie made from a leg from a pair of tights. The cherries, because they are probably jointly our favourite fruit and even in high season they remain very expensive in the shops these days. The greengages are a nod to the beautiful Reina Claudias we buy when in northern Spain: greeny-gold bite-size fruits tasting like honeyed plums in all the supermarkets in July and August. Both sets of trees have been grown on dwarfing rootstock, so that - I hope - they will fruit better and quicker than an ungrafted tree, but also crucially to keep the mature trees to a manageable size, so that we can reach all the fruit! Both cherry trees are of the variety Stella, which is a sweet dessert cherry producing beautiful dark red fruits, and grafted onto Colt rootstock to keep the overall height down to around 3.65m when fully grown. I figure that if the birds look like eating the cherries before they're ready (and they will) I should be able to throw a net over the whole tree to keep the fruit safe until it's ripe. The greengages are Reine Claude de Vars, and grown on St Julien A rootstock, which will cap the tree at about 4m at its full height. All the trees were bought from Victoriana Nursery Gardens - I've had consistently good results with their plants and on this occasion they had the varieties I was looking for in stock at the right time. Each tree was planted in the same way: with the bare roots soaked for an hour or so before planting, I dug a hole big enough to take the sapling comfortably, so that when placed in the hole the soil will come to the same level as it did in its pot. I've been told it's best to dig a roughly rectangular or square hole to encourage the trees to push out strong roots (apparently in a circular hole, the roots will grow round and round without spreading so much). Similarly, while you should refill the planting hole with plenty of organic matter, and water it in well, you shouldn't add fertiliser at planting time: you want the tree to send down strong roots in search of nourishment, not loll around luxuriating in an artifically enriched environment. 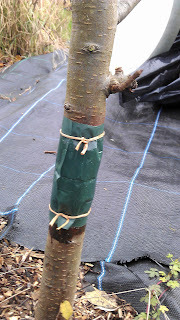 I also staked each tree to give it support while the roots establish themselves, and tied the main trunk to the stake with a soft tie (you can buy these, but I tend to use old pairs of tights for this). Finally I watered the tree in - a whole bucketful - added a mulch to conserve the water in the soil and help to suppress weeds, and tied a greaseband around the main trunk of each. The greasebands protect very specifically against several varieties of winter moth: wingless females will climb up the tree to mate during the winter months and it is their caterpillars which eat the leaves in springtime. The other great pest of apples, pears and plums (and other members of the plum family) are winged moths which lay their eggs on the leaves, and whose caterpillars bore into the ripening fruit to feast. Codling moths can give you maggotty apples and pears; plum moth will affect plums, greengages and damsons. Plum sawfly (not the same as plum moth) will cause the unripe fruit to fall to the ground prematurely. Greasebands won't deter any of these winged moths. Here I've found pheromone traps to be effective. You place a pheromone capsule on a sticky band placed inside a rainproof trap. Hang the trap at about 4ft high in the tree and the female should be distracted by the pheromone and fly into the trap instead of the tree. 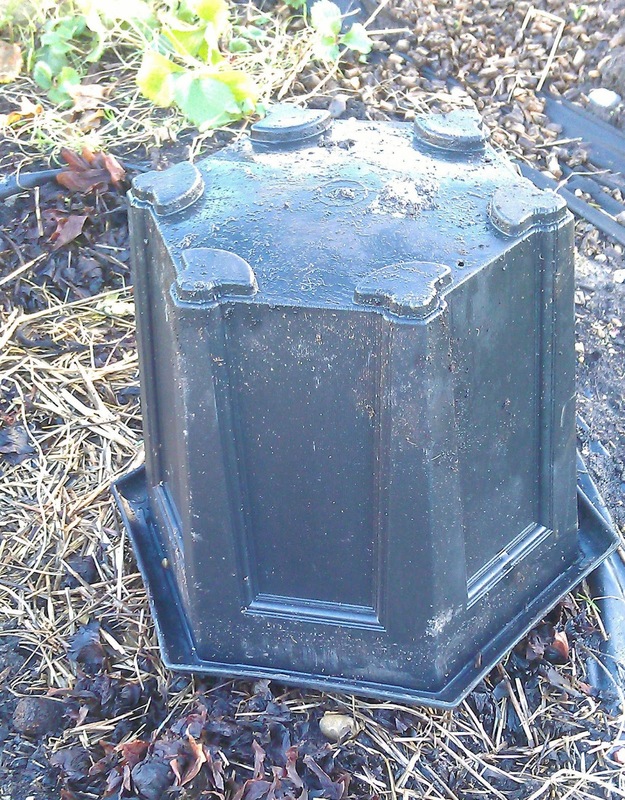 On a commercial scale growers use these traps to ascertain how great a problem they have before deciding whether they need to use sprays to eliminate the moths. 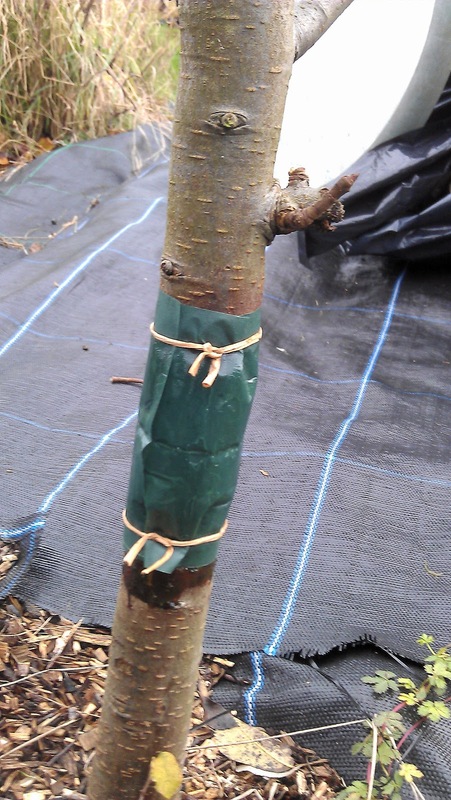 On a domestic scale, ie, if you have just 2-3 trees of each type, the traps can keep moth damage down to a minimum. So I take double precautions and the results vary. Before I used the pheromone traps, my plum crop was largely unusable. Since installing the traps and renewing them each spring, a bad year means that say one in four plums will have some plum moth damage, a good year, such as 2012 will have zero damage. Yet this year, I had undamaged Conference pears, but maggots in many of the Doyen de Comice. The quince have never suffered any moth damage, although codling moth can attack quinces as well as apples and pears, according to the RHS. down to the generally wet conditions and a late frost which we think got the blossom in late April.